Britain, A Christian Country. A Nation Defined by Christianity and the Bible, and the Social Changes that Challenge this Biblical Heritage by Paul Backholer. 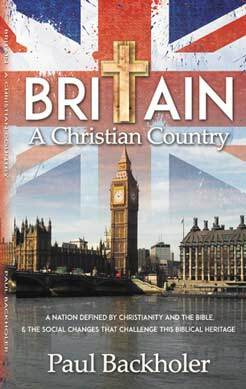 For over a thousand years Britain was defined by Christianity, with monarchs dedicating the country to God and national days of prayer that saved the nation in its darkest hours. Discover the continuing legacy of the Bible in Britain, how faith defined its nationhood and the challenges from the 1960s to the present day. Paul Backholer is a British broadcaster and the founder of ByFaith Media. He is the director of ByFaith TV which airs on multiple platforms around the world and is the producer of several Christian documentaries. Paul is the author of Jesus Today - Daily Devotional, Holy Spirit Power, Heaven � A Journey to Paradise, How Christianity Made the Modern World, The Exodus Evidence and The Ark of the Covenant. Paul studied in a British Bible college and has travelled to over forty nations.